yesterday celeste hung and gave me a blinking system folder icon when restarted. i tried not to panic. fortunately, upon a second try, she finally rebooted. unfortunately, i should have done more about it than just thank my lucky stars, as it turned out to be an ominous portent for today's troublesome toil. today she also hung and gave me a blinking system folder icon, but wouldn't reboot. disk warrior couldn't fix it completely, but fixed enough so she would boot and let me try disk utility, which told me i had an "invalid node structure." it also gave me enough time to back up the Applications & Library folders (fortunately, we back up our home directories every week). i rebooted her using the install disk, hoping disk utility would be more use if i wasn't using celeste's system folder as the startup drive. that got me a little farther: i was told it would start fixing the B-tree Catalog, but then it would repeatedly fail. i even tried booting into single-user mode to use fsck, but it told me nothing i didn't already know. so i tried to do an archived install, but the install disk couldn't even see celeste as a legitimate drive to install the os on, so there was no other option: i had to erase & install a new system. eeep. the good news is that it looks like it's mostly worked. *knock wood* at any rate, that's almost 12 hours of my life i'll never get back. the only good thing about it is that if it was going to happen, i'm glad it happened this week, and even today i had a lot of time to devote attention to it. but man, now i'm behind again! today i biked to the lent's farmer's market! 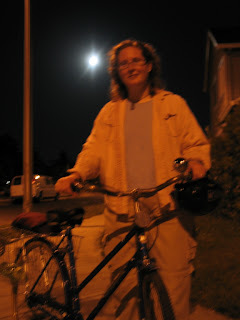 i'm very destination-driven when it comes to biking: if i don't have a destination i tend to want to quit much sooner. in this case, it meant i kept going despite the rain that appeared halfway through the trip. i was delighted that it was cloudy this morning because i have been biking after the sun has gone down, primarily because it's cooler. but i wasn't prepared for rain. fortunately it was a short burst that ended by the time i reached the farmer's market; once i wiped off my glasses, i was fine. i admit to being a little disappointed: there are probably about six booths at the market that have veggies, food & flowers, and three more community-oriented booths. one of the booths sells tamales, which i really wanted to love; little would have delighted me more than the thought of a sunday ritual that included biking to the farmer's market for tamales and bringing them home for lunch. i'll probably keep going regularly, even if the selection is meager, because if nobody goes they'll stop having one, and i want to help it grow. 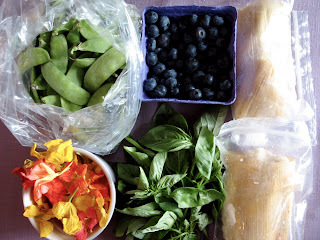 i came home w/ (from top left) snow peas (i had meant to get snap peas), blueberries, tamales, basil & nasturtium blossoms. i got 4 tamales total, one of each kind, and i was very happy that half of them were vegetarian so sven could share. you might not think it was worth a bike ride to get this, but i still think it's exciting, and it keeps me eating local. so it turns out i can make the entire trip there & back, including the time spent at the market (and a very brief detour to buy a darth vader mask for sven at a garage sale), in an hour. i made a mistake and thought the market was on holgate & 92nd, which meant i travelled down holgate today, but it turns out to be on foster & 92nd, which means i can take the springwater corridor trail most of the way the next time. when you're walking around downtown in a cow suit, "got milk?" is the question you get asked most often. and people feel compelled to yell "moooooo!" at you, too. if you're sitting down, people will generally leave you alone unless they REALLY want to know why you're in a cow suit. a few people will ask if they can take your picture, or have someone take your picture standing next to them. if you're lucky, two high school girls from kansas will ask you to be in the video they're making of "puttin' on the ritz," so you'll dance and sing the lyric, "dressed up like a million dollar trooper." so that was my day yesterday. another delightful go game: this time as a "mad cow" runner. when a team spotted me i had to run away from them until they tagged me, at which point they had to make up why i was a "mad" cow in a bad mooooood and take a picture of me in that situation. despite telling them they got bonus points for creativity, out of 8 teams, 4 of them thought "milking" me would be funny and stood there with one hand on my "udder" until one of their teammates took a picture. it was all i could do to keep from rolling my eyes. but i really appreciated the teams that went out of their way to take a picture: one team took me out of the game zone so they could pose me in front of a carl's jr. hamburger poster; another took me to a knife shop and convinced the owner to let them borrow a cleaver; another team picked me up and tipped me over. i mentioned sven gave me a lime for an early birthday present earlier this month, but i kept it just long enough to name it "comet" before trading it in for another bike. that means i've gone through three bikes this summer, but i think i finally have the bike that is just right for me! so i had been looking at getting a new bike early in may. mph says that the way he feels talking to bike guys is sort of the way people must feel talking to him about computers, and i understand that. i tried to overcome my fear & intimidation, but even so it took me over two months of test riding bikes at the division bike gallery before i decided i was probably going to get a trek lime. i thought it was a fairly appealing shape & color, but i thought the automatic shifting was fabulous! it reminded me of one of the reasons i bought trixie: a great concept, and if i wanted them to continue to be made, i should buy one (a tactic that worked out very well w/ the prius, i might add ;). so i was just trying to save towards a $500 bike -- and lo & behold, i got two catsitting jobs that pretty much covered it! i was waiting until they were over before buying the lime. but while biking w/ stella in the meantime, i finally figured out how to effectively use a 3-speed bike (previously, i was basically keeping it in first gear all the time). so when sven surprised me by buying the lime for me, i was shocked to discover the automatic shifting was a detriment! my feet kept slipping off the pedals when it would decide to downshift, and it felt like it wanted me to pedal a lot faster than i ordinarily want to. i even tried all the adjustments, but i never felt in control. so back to the bike gallery i went. i wasn't very hopeful, but at least i knew enough so i could narrow my options. i definitely prefer the cruiser style, so i was testing the electra townie and the trek pure series. the townies are prettier & i like their shifting mechanisms more. i was pleased that i could consider higher-speed bikes: in april of this year, i thought 3 speeds was way too many! after another week of evaluation, i decided my perfect bike would be 7 speeds with an internal hub and a coaster brake. 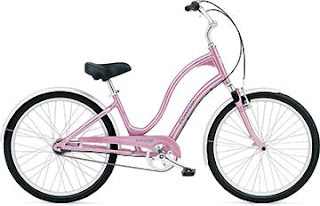 it turns out the electra townie 7-speed only comes in this one "hazy lilac" color, and i almost didn't get it because of it. 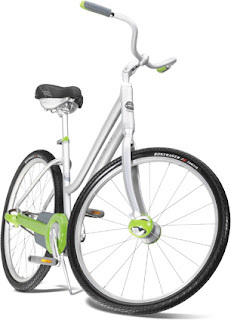 i almost went with the 21-speed instead, since it came in a silver or a cream. i even had an hour-long phone conversation w/ mph about the merits of a 21-speed derailleur and a 7-speed internal hub. but ease-of-use won out. andromeda is totally the mac of bikes: not too many choices, but does everything else i want in style. so far she's already been through four different tires: mph recommended a kevlar tire w/ slime seal, and since i don't want a flat tire if i can help it, i swapped out her original tires. but those tires rubbed against the fenders & picked up rocks, and it turned out the bike gallery installed tires that were too big. so i swapped -those- out with a smaller size, except that the tires were still picking up rocks and rattling in the fenders. so i swapped them out for smoother tires. it still sounded like they were picking up rocks, but at that point the bike gallery techs were irritated and i was embarrassed, so i went home. what they didn't tell me and what i wish i knew then is that as i've ridden these tires, they pick up less rocks! which explains why the original tires didn't seem to have the same problem -- they had been broken in a bit by the time i got the bike. on her first night home, sven made brass brackets to fit stella's bike baskets to andromeda -- nobody sells her type of basket anymore and i love them with an irrational fondness. after a late-night trip last week, i'm still trying to figure out how to get her hung on the max, and i haven't attempted to out her on the bus yet. but she almost glides down the streets and it's much easier to get up hills, which is an important consideration since every route back home is all uphill. 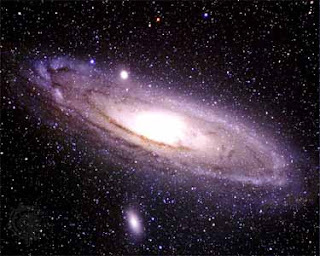 so welcome home, andromeda! thank you for your faithful service, stella! and i appreciate your brief visit, comet! fairies mowed our lawn today! i suspect the fairies are our neighbors, who appear to be less tolerant of dandelions than we are. the last time they asked if they could mow the lawn since they were doing it anyway; today they simply did it and we walked out the door to find our lawn 2 inches shorter than it was the night before. they're not training us correctly: the lesson i'm learning is that if i let it go long enough, the lawn will be magically mowed for me one day! i called our u.s. senators (ron wyden & gordon smith) and asked them to vote NO on the "pence amendment" to the labor-hhs spending bill. pence is a senator from indiana; the amendment specifically seeks to ban planned parenthood from receiving title x family planning funding. which is totally insane, because that's literally 95% of what they do. i also asked our senators to speak on the floor against this amendment. turns out that vote is over & done with (and it did NOT pass), but it's still a good exercise to recognize how painless the process of speaking up really is. 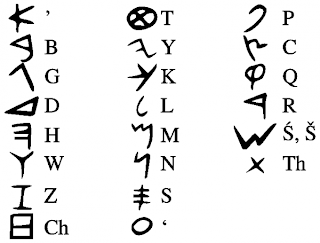 michaelmas sent me & philip a link to the Which Ancient Language Are You? quiz. i'm Phoenician! michaelmas is incomprehensible akkadian; philip is revered heiroglyphics. it doesn't look like these people are eagerly anticipating this site. it looks like they are bored & depressed, like they've been waiting a looonnngg time. the guy on the left has had enough: he's leaving. 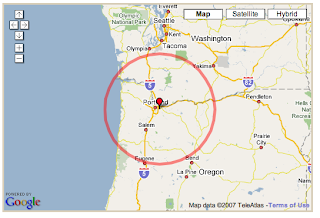 so it looks like i get some seafood, but it doesn't even reach bend or yakima. forget about all the delicious cheese that comes from rogue river, though it looks like tillamook is still good. i am likely to stick w/ my vague washington/oregon "preference radius" as a way to remain conscious about sole food without becoming obsessed or grim about it. fortunately, you can't get more local than the raspberries jalex planted by the studio stairs. for years i've been enjoying them out of hand or w/ whipped cream in abundance for the month they're in season. this season i wanted to try preserving some of them and making other stuff with them, so 1 month's worth of raspberries has so far amounted to 2 quarts of ice cream, 6 ice cream pops, 3 glasses of trifle, 2 small raspberry-stout shakes, 1 smoothie, 3 largish jars of jam, 2 small jars of sauce (1 for todd's birthday present), and 1 quart of whole, frozen raspberries to use later on in the year. the rest of the garden is coming along. the lettuce will feed us as many salads as we care to eat while we are waiting anxiously for the tomatoes to come in. the herbs are happy happy. the pumpkins is doing that crazy thing where it zips across the yard overnight and all the squash-like plants are blossoming, though the watermelon & cantaloupe are looking like they're just never going to produce anything. the grapes & blueberries will do better next season, i think, like the strawberries have done this season (i'm slicing & freezing them). i was hoping to plant corn this year, but that doesn't look like it will happen. we also started a biweekly organics to you subscription, in part because when i buy vegetables & fruits i buy them conservatively and usually out-of-season. not all of it is local (the pacific nw isn't a great place to grow mangos, for instance). but it encourages me to eat more & more varied fruit and veggies, including things i don't usually think i like (does someone have a good beet recipe for me to try?). speaking of summer, tonight alex & amelia had a little ice cream social to celebrate the end of first grade for miles. i was the only one w/o kids there, but i didn't mind. amelia made homeade strawberry ice cream and i brought fried-ice-cream-flavored ice cream (and later, so did someone else! what a faux pas!). i also got to see amelia's finished studio, which i think is really quite awesome. i had a conversation with someone this week that included the question, "i think women hold everything together, don't you?" i have a hard time being complicit in conversations that pit one type of person against another type of person, especially in a gendered way. men are no more helpless than women are, and i think perpetuating that myth doesn't do any of us any good. after years of identifying myself as a humanist because of the backlash against feminism, i feel more compelled to identify myself now as a feminist to reclaim it. and while i think men should be more cognizant and deferential to the struggles women still face, i think girl power should be about more than marginalizing men. i just saw the first appearance of the scarlet star this summer: mars has returned! so very glad i didn't buy an iphone: while i was walking around this evening between linda's encaustic show & alesia's calligraphy show, i saw an iphone in the window of an at&t store, so i stopped by to check it out. i couldn't make that thing type to save. my. life. i was never on the right keys and couldn't manage to adjust my fingers correctly. "trusting" the keyboard just turned "a is for anna who fell down the stairs" into something like "reis for sennjs qedsw fell spent jwdreaitd." afterwards, i saw the security guard delete my mangled message so that nobody else would see it. yesterday michaelmas & i went linda's house for a bbq. then we picked up sven & headed to kristin & todd's to watch michael's annual dvd, 1776 (after a few school house rock videos, like "how a bill becomes a law"). then we headed to the hawthorne bridge to watch the fireworks. also, sven gave me a lime (turn off your speakers first if you click that link) as an early birthday present so i have all summer to enjoy it. :) compared to stella, "comet" seems to help me climb hills better, but it's got a couple of quirks. michaelmas & sven tooks spins on it, too, and nina thinks it's her new best friend. quick update: i briefly got to see saturn & venus in a cloudless strip between the horizon and the cloudbank, though it didn't last long. with just binoculars, you couldn't make out the two separate planets because of the atmospheric turmoil, but it was still unmistakably larger thanj just venus alone. also, this marks the start of toddapalooza, so we took him to pambiche for brunch today. very nice! good atmosphere, good waitress & good food. and free birthday dessert for todd that even four of us couldn't finish -- not because it wasn't delicious, though! we tried to go there once for dinner and it was pretty busy, so it looks like lunch/brunch is a better option. it's been too cloudy to see the venus/saturn conjunction. argh! in a not-very-related note, all the arugala has gotten spindly & flowered when i wasn't looking, and the romaine has exploded. so it looks like we'll be giving away salad produce again this year. who wants a bag?